David W. Sweeney submitted this photo and caption. 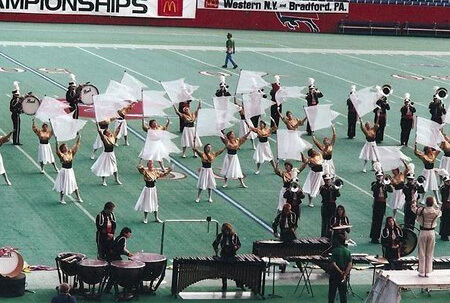 This photo was taken at the DCI World Championships in Buffalo, N.Y. in 1990. This was my last year as drum major for the Spartans, placing 7th in the A-Class. Thanks to DCI.org, the DCI Facebook group and the Spartans Facebook group, I have recently reconnected with many Spartans alumni. It's so great to talk to old friends and post pics from the "good ol' days."